In many blogs and news sites images are mostly included as an addition to the content. Space is often limited and therefore it would be a good idea to integrate a miniature image gallery that does not occupy a lot of space. Micro Image Gallery jQuery plugin transforms a set of images into a tiny gallery with several options. It allows to switch between a grid view which shows a preview of the images as thumbnails and a single view showing one image only. The navigation bar can be hidden and sliding out when hovering over the gallery, or visible. 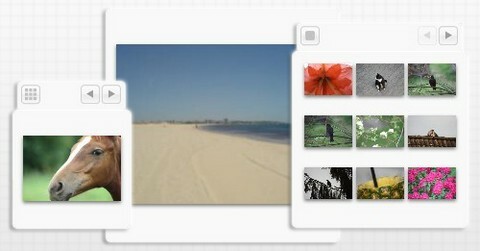 A total of nine thumbnails are shown in the grid preview. The plugin will automatically resize the image according to the chosen gallery size. The demo doesn’t even load for me.